Ritalin is a central nervous system stimulant that is prescribed to treat symptoms of ADHD and narcolepsy. People commonly abuse it to get high, stay up and study, or lose weight. Those who abuse it will take the pills orally, crush them up and snort them, or inject them. Signs of Ritalin addiction include taking more Ritalin than planned, repeated failure to cut down on use, strong cravings to use and spending lots of time getting Ritalin, and using it and recovering from effects. Withdrawal symptoms include insomnia, increased appetite, fatigue, hypersomnia and vivid, horrific dreams. Don't Wait. Get Help Today. Call to find a recovery program for Rtialin addiction today. Ritalin is a brand name for the prescription drug methylphenidate. It is typically prescribed to treat symptoms of attention deficit hyperactivity disorder (ADHD) in children, adolescents and adults. An extended release form of the drug, which is also used to treat ADHD, may also be prescribed to treat narcolepsy. How long your program is. Where the rehab center is located. Whether it has luxury features such as tennis courts, beach views or chef-prepared meals. Call to get more information about your insurance coverage and your treatment options. If you don’t have insurance, the Substance Abuse and Mental Health Services Administration’s helpline can give you more information about finding a rehab program in your area. If you find yourself unable to control your use of Ritalin, you may want to seek substance abuse treatment at an outpatient or inpatient rehabilitation center. Some people also find the support of 12-step programs helpful. Outpatient centers let you live at home while traveling to a treatment facility throughout the week to meet with a therapist and participate in group therapy. Inpatient or residential centers require you remain at the facility during addiction treatment. You participate in therapy or group meetings during the day but are able to participate in other activities such as recreation and watching TV. 12-step programs bring together people who are struggling with a similar addiction. A sponsor, or someone who has completed the 12 recovery steps, will support you as you work through the program. It may take some time to figure out which treatment option is right for you. Think about which factors you want a recovery center to have and learn more about how substance abuse treatment works. Most people either take the pills, crush them up and snort them or inject them. 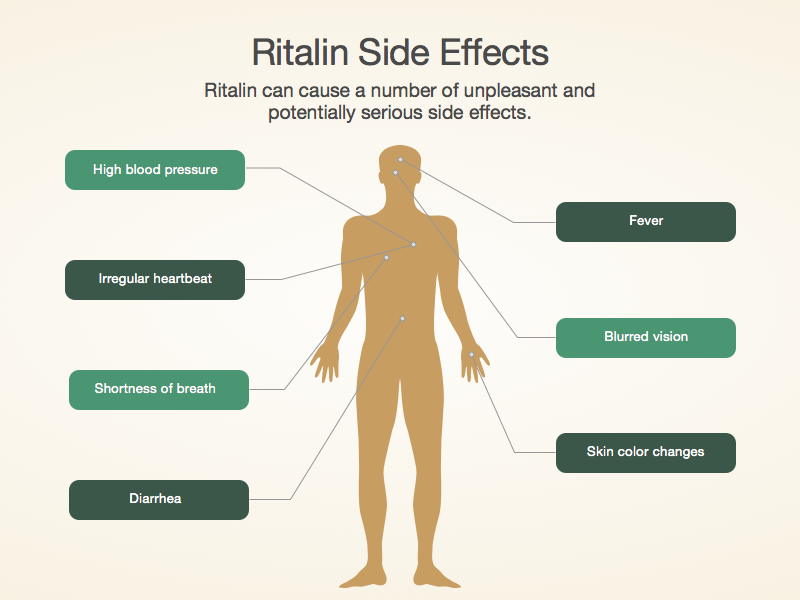 People typically abuse Ritalin to help them stay up and focus or to experience a euphoric high. People may also use it to lose weight or to enhance performance and attention. Ritalin is commonly abused by high school and college students to improve academic performance but also to get high. It is often taken orally. But it can be abused via alternate routes—including crushing the pills and inhaling the powder or dissolving it into solution to be injected into the bloodstream. The effects of the drug will peak approximately 1 to 2 hours after administration.2 These effects can last between 4 to 6 hours for the immediate-release form of the drug and between 3 to 9 hours for the extended-release form. Ritalin can also be dissolved into a fluid and administered subcutaneously, intramuscularly or intravenously. When injected directly into a vein, the drug’s effects peak around 1 to 3 minutes after administration. Skin color change in fingers or toes. Rhabdomyolysis (breakdown of muscle tissue). Marital, family and personal difficulties. According to the DSM-5, withdrawal symptoms can vary in onset. Depending on length of addiction and amount of dose, symptoms can begin from a few hours to a few days after use of Ritalin has stopped. Major depression is one of the more critical withdrawal symptoms and may require medical attention due to suicidal ideation. Who Answers? to speak to a treatment representative about Ritalin rehab programs. More Ritalin is taken than planned or over a longer period of time. Repeated failure to quit or cut down on using Ritalin. A disproportionate amount of time is spent acquiring Ritalin, using it and recovering from its effects. Extremely strong cravings to use Ritalin. Repeated use despite negative consequences at work, school or home caused by Ritalin use. Continued use despite social and interpersonal problems caused or worsened by Ritalin use. Pleasurable activities and hobbies are given up in favor of Ritalin use. Repeated Ritalin use in physically dangerous situations such as driving or operating machinery. Continued Ritalin use regardless of physical or psychological problems caused or aggravated by drug abuse. Tolerance: needing more Ritalin get the same desired effect or “high” or experiencing less effects over time when taking the same amount of Ritalin. Experiencing withdrawal symptoms specific to Ritalin or taking Ritalin to avoid or relieve symptoms. Ritalin is classified as a Schedule II drug. This means that it is tightly controlled due to the high potential for abuse and psychological and/or physical dependence. 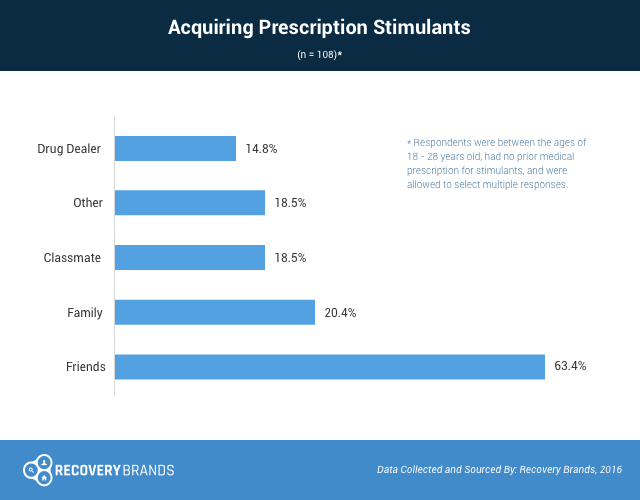 Extended-release forms of the drug deliver the medication to the body over time, rather than all at once, making it more difficult to get high. Overdose can occur with Ritalin, resulting from an overstimulation of the central nervous system. Overdoses of stimulant medication can lead to very serious heart problems or even death. If you or someone you know may be suffering from an overdose of Ritalin, call 911 or visit the local emergency room immediately. A high number of young people acquire stimulant medications without a doctor’s prescription, which can result in widespread abuse. But where do people in their 20s get their prescription drugs? A 2016 Recovery Brands survey revealed that 63% of people between the ages of 18 and 28 get their ADHD medications from friends. More than 20% get access to them via their family members, less than 20% through other students, and more than 14% through a drug dealer. People with a prescription can help prevent substance misuse by keeping tabs on their stimulant medications. Many recovery options are available for Ritalin addiction. If you or someone you love is struggling with Ritalin, call to speak with one of our treatment support specialists.
. Morton WA and Stockton GG. (2000). Methylphenidate abuse and psychiatric side effects. Primary Care Companion J Clin Psychiatry 2:159-164.
. Volkow ND, Ding YS, Fowler JS, et al. (1995). Is methylphenidate like cocaine? Studies on their pharmacokinetics and distribution in the human brain. Arch Gen Psychiatry 52:456-463.
. Bogle, K., & Smith, B. (2009). Illicit Methylphenidate Use: A Review of Prevalence, Availability, Pharmacology, and Consequences. Current Drug Abuse Reviewse CDAR, 157-176.